What is the biggest obstacle to writing a book? Time? Procrastination? Lack of ideas? Writers’ block? Netflix? Trick question. All of those things really come back to fear. Fear is the single biggest obstacle in the way of writing a book, and I would suggest, all creative work. But I bet you are. Just a little. It’s easy to think of fear as the visceral, physical reactions, like heart palpitations or shaking legs when you see a creepy clown. But fear isn’t always so loud. Like a computer virus, fear infects our brains from a young age and spreads with each year. And like a really good computer virus, you may not even realize it’s there. It’s a background process that pervades your everyday life and affects your interactions with the world. Instead of stealing your credit card information, it steals your joy and robs you of the confidence to pursue your passions. So what does fear have to do with creativity? Some fears are good. Like carnival rides. I have a hard time trusting a roller coaster that was broken down into parts in a semi truck, all of its bolts in a coffee can, just this morning. Seriously though, fear can protect you from danger. Sometimes fear tells you to observe your surroundings and to look for a better-lit street. Sometimes fear tells you that ominous sky full of thunderheads like dark smoke is a sign of bad weather, and that maybe you shouldn’t drive right now. Those are protective fears that protect us from legitimate danger or threats, or even from causing pain to ourselves or others through our actions. But what about those less concrete fears? What about fear of rejection or failure? Have you ever had a crush on someone and couldn’t bring yourself to tell them? Because…what if they don’t like you back? So, let’s talk about something other than writing for a while here. I really like to lean into the whole free spirit, starving artist stereotype. Before I started writing books, I made the highly practical choice to get an undergraduate degree in trombone performance. While I ended up going back to school for a teaching degree, I’ve been a professional musician since I was 21. Not long after I moved to my current stomping grounds, I started playing for local musical theater productions. About three years ago, the choreographer for a local production approached me during a tech rehearsal for Fiddler on the Roof and encouraged me to audition for the show, “A Chorus Line.” I hemmed and hawed, but secretly, I was interested. What she didn’t know was that through the last seven-plus years of playing music for the shows, I’d really wanted to audition. I even worked up an audition song several times, including for the shows Into the Woods and Chicago. And every time, I was too nervous, too afraid to do it. I knew the people who would be behind the table, and I couldn’t bear the thought of performing badly in front of them, especially since they knew me already as a professional musician. I didn’t want to be a star; I just wanted to be a part of something new and exciting. Well, I eventually worked up the nerve and did it. (There’s some great synchronicity in the fact that the opening number of A Chorus Line is called “I Hope I Get It.”) I went in and discovered, much to my horror, that we would all audition in the same room in front of everyone else. Despite that, my audition went surprisingly well. I checked my email obsessively for weeks, and finally, I got it. A callback. I had to go in and sing and dance again. Well, that’s a good sign, right? I wasn’t so bad that they decided right away I was out. I auditioned again. Now, depending on how well I’ve foreshadowed this, you might guess what’s coming. I didn’t get it. I didn’t get cast in the show at all. And I’d like to tell you that I handled it extremely well, but I didn’t. I cried in my bathtub. It hurt. Why? Why did it hurt? Because I felt rejected. In my mind, that fear that made my heart race in that very first audition was validated. My singing wasn’t good enough. I was too awkward of a dancer. I didn’t belong. I made the mistake of thinking I had a chance, and clearly I was wrong. It really did hurt. Not only did it hurt to be denied something I had hoped for, it hurt to grapple with a question of whether I had a realistic view of my own skill and talent. Now, why am I telling you all of this? This post isn’t called Oversharing 101 or I Have Way Too Many Feelings. Life is full of these moments. When you survey people and ask them what they’re afraid of, you get a lot of the standard answers: clowns. Spiders. Heights. You might get broader answers like terrorism or climate change. Some will get deeper, like dying alone or losing a loved one. But those aren’t fears that pervade our everyday existence. Most of us don’t go through the day thinking about how terrified we are of spiders. But the deeper-rooted fears, that fear virus infecting our operating systems, well, those crop up every day. We fear what others will think of us. Will they think we’re too proud, too full of ourselves for daring to put our work out there? Will they think we’re really bad at writing or singing, or whatever it may be? Will they just plain not like us? Worse, what will you think of yourself? Will you take a risk and realize that you’re not as good as you’d hoped? Or worse, that you’re not as good as you thought you were? Fear of rejection and failure – whether real or perceived – is the single greatest obstacle to creative work. So how do we avoid it? And friends, that’s the wrong answer, but it’s the one many people choose. The only way you can completely protect yourself from the pain of failure or the pain of rejection is by never trying. If you don’t put yourself out there, you don’t write the book, you don’t audition for the show, you apply for the great internship, you don’t try out for the team, no one can ever reject you. But an absence of failure is not success. It’s stagnation. The author in question, by the way, was JK Rowling, who has now earned over $25 billion dollars from the Harry Potter series and the related properties. Among other authors who have been rejected? I was going to compose a list, but I’ll save you some time – probably ALL of them. There is no way to avoid rejection and failure except for to not try. So what does all of this have to do with you? You may not be at the point where you’re looking for publishing, but if you’re here, you’re interested in writing. And this fear presents itself every time you sit down to write. The experiment is this – you do not know whether the cat is alive or dead until you open the door. In terms of quantum physics, the cat is both alive and dead. Now obviously, this gets into some theoretical weirdness, but the idea is that you can’t be certain of the cat’s status until you observe it. Opening the door confirms the cat’s fate by making it real. Ideas are this way. If you’re anything like me, you’ve got stories and characters bouncing around in your head. At this point, they’re just lovely washes of color. I have a few distinct details, and a sense of excitement about exploring them. They don’t exist yet. Are these good or bad stories? We don’t know. We have to open the room and make an observation by putting it down on paper. And that’s why fear is an obstacle. Because here’s what I’ll tell myself. “I’m not quite ready. I need to think about it a little more.” And sometimes, I’ll take the step of writing down details about the setting or the characters. Sometimes I’ll even sketch out ideas for a plotline. There’s value in these steps, but sometimes I use them as a substitute for actually taking the plunge and writing the book. Why? I have ideas. (That’s never the problem.) I think they’re pretty exciting. Because here’s the reality. Once it’s out of my head and I start putting it on paper, it can be judged. I’m going to have to deal with the fact that it’s harder than I thought it would be – and it always is – and that it’s not perfect. I’m going to commit the cardinal sin of comparing my halting first drafts to the polished published works of my favorite authors. Once it’s real, it can be assessed, measured, and judged, just like Schrodinger’s Cat. It can be rejected. It can be found inadequate. So, what’s the harm in letting an idea cook a little longer, until you’re “really ready?” First, you’re eventually going to get frustrated because you have this REALLY GREAT IDEA and no one else knows about it. And your friends only want to hear about your idea for so long before you actually write the book so they can read it. And before then, some other author whom you suspect of psychic thievery is going to publish a book that’s really, uncannily similar to what you were thinking about, and you’re going to want to pull your hair out because you TOTALLY thought of the same thing, but now if you write it, it looks like YOU copied them. So how do you get rid of the fear in order to unlock the door? Well, I wish I could tell you. You don’t. Fear is natural. It’s so hardwired into you at this point that you can’t get rid of it entirely. But what you can learn is how to acknowledge it, work around it, and even learn from it. I’ve spent the large part of this missive discussing my own fears and the failures of others to hammer home one REALLY IMPORTANT POINT. 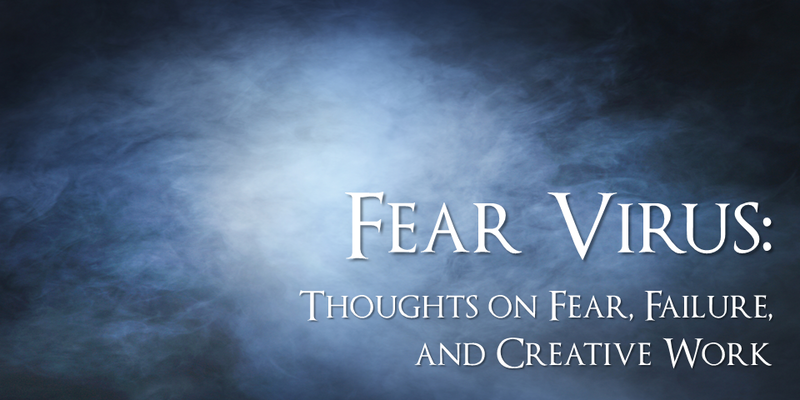 For writers, fear can feel like “writers’ block,” and OH do I hate the term writers’ block. (I don’t believe in it but that’s a whole other topic of discussion.) It can also manifest as a tendency to over-analyze. It leads you to sit on the first paragraph for three days because it has to be JUST RIGHT. That’s not perfection. That’s avoidance. That’s refusing to move forward where you know there will be further challenges. It’s just fear in another costume. It can manifest as a fear of letting someone else read your work. And Lord, is that scary, to hit send on an email containing your precious manuscript to someone who might not know what a precious gem it is. So once you acknowledge that your fear is normal and you recognize it for what it is, how do you do creative work? The hardest part is getting started. So how do you do it? Because here’s the secret. When your ideas are still in the box – while it’s still Schrodinger’s Manuscript – they exist in this dreamy state of perfection. But they’re not real. They’re immaterial, nothing of substance. You open the box, you start committing to paper, and you run the risk – almost certain – that they won’t be as good as you hoped. When you get started. You might write ten pages of crap. But you can work with crap. You can’t work with a blank page. The reality is that your five pages won’t be all bad. And even if they are, you learned one way that the story doesn’t work, which will educate you on how it should work. I am going to commit another act of Writer Blasphemy. I said already that I don’t believe in writers’ block. I also don’t believe in the Muse, a supernatural force that brings you inspiration and therefore dictates your writing schedule. Instead, I view writing the same way I view any other “doing” skill. I mentioned already that I’m a musician. If you want to improve at music, you practice. You play your scales, you do your vocal exercises, and you do them regularly. If you play a sport, you get better at it by practicing regularly. Most things require intentional, regular practice to get better. How do you practice writing? You do it regularly. Set a goal to write a certain number of words or for a certain amount of time on a regular schedule. \When you start using the creative side of your brain, it’s like starting a good wood fire. It takes some work to get the fire started, and then it burns continuously as you feed it more fuel. As you start using your creative process to describe your surroundings or to write snappy dialogue, you’re going to become more receptive to those things in your everyday life. That’s not a supernatural force, dear heavens, it’s not A Muse. It’s the natural result of you using your creativity and being receptive to ideas. As long as you continue to tend the fire – like adding more wood to your bonfire – your creativity will continue to feed itself. The momentum will continue. In order to do creative work, you have to understand that creating and altering are two separate processes. You can’t write and edit at the same time. I’m not saying that you shouldn’t think critically about your work as you do it, but separate the processes of actively writing – new words on paper vs. polishing your writing – changing what you have. Let go of the need to find exactly the right word for the color of the sky just after sunset. Make a note of it and go back later. Every time you stop to edit while you’re writing, you’re pumping the brakes and making it hard to get your momentum back..
One aspect of creative work that often gets left out is feedback. Now – I think it’s really important to work at your craft and to find confidence in yourself. You cannot define your work based on what other people say, and if your happiness and self-esteem are defined by other peoples’ opinions, you’ll never really be happy because it’s a moving target. One bad review or rejection will sink you. (By the way, that advice applies to your life in general, not just art!) At some point, you have to validate yourself and believe that you are worthy, and to find value in your work. That said – if you seek to improve at a skill, and you ever have intentions of making your work public, potentially with the intent of making it profitable (AND THERE’S NOTHING WRONG WITH THAT! ), then you have to seek out feedback. You can get better at a lot of things by just practicing them. But you’ll get much better “bang for your buck” by pairing practice with meaningful feedback. What does feedback look like for writers? In the early stages of a manuscript, that might be a beta reader, which is someone who just reads the work and tells you what they think of it. This might be a friend of yours, or a professional. Later on, that can be a professional editor who will rip your work into bleeding shreds. But uh-oh – there’s the fear again. Fear of people not liking your work, fear of it not being good enough. What if the reader says they HATE it? I’m still here. You will not die from negative feedback. You can, in fact, learn from it. And she was right. I learned from that. Let the reader decide if the joke was funny. By broadcasting ISN’T THIS FUNNY, I was beating the reader over the head with it, and would probably have made them less likely to find it funny. She was very critical of my work, but her criticism – which was coming from her experience and education – helped me become a better writer. Rejection and failure can actually be great learning experiences in this regard. My one caution to you here is that not everyone is equipped to give you useful feedback. Your family members will probably tell you everything you do is wonderful, because it’s pretty darn impressive to write a book. “My Auntie said I’m even better than Harry Potter” is not a ringing endorsement. Your friends, to some extent, are similar. By all means, share your work when it’s ready with people who will appreciate it. But don’t confuse supportive commentary with constructive criticism. So circling back. After I finished crying in the bathtub and deciding I should have never tried out, I should have stuck to the status quo (Is a High School Musical reference too outdated? ), I dusted myself off and decided my short-lived musical theater career was over. Until about two days later, when I got a phone call asking me to be a part of another show. It was a small ensemble role, but it was a chance to be a part of a show. So I said yes. And it was scary. I’m not going to stand here and tell you I was a pro. I wasn’t. But I got started. I had never done musical theater, and I got…”gently reprimanded” multiple times by the director on what I should be doing. Some of the feedback stung, but it was worth it when the show went up, and I got to see the audience transported into a magical world for an evening. There is nothing like sneaking a peek at the audience to see that they’re utterly enchanted by the magic of theater. I was hooked, so I wanted to be in another show. So I sought out some vocal lessons and took a few dance classes. This time, I was still nervous in my audition, but I took a few more risks. I got a speaking role this time. I continued to work at it, learning a little more each time. Sometime later, we did a production of Beauty and the Beast. I wasn’t going to take the risk – but I really wanted to play a character this time. Specifically, the absolutely ridiculous, stereotypical French feather duster, Babette. I wasn’t going to write it down, but I added “I would like to read for Babette” on my form. I’m pretty sure I wrote it in tiny letters because I wasn’t feeling too bold. But I did. It was an incredible, magical show, and that was the start of my unending string of successes! I auditioned for a role this year and didn’t get it. Oh no! You may experience failure. You may experience rejection. Scratch that. You will experience failure and rejection. But that’s just fear talking. Fear wants to protect you, keeping you in a cocoon where nothing can hurt you. But as long as you stay in the cocoon, you will never fly. But the absence of failure is not success. That safety is actually stagnation. So get started. Understand the fear for what it is, calmly acknowledge it, and then break out of the cocoon. Do it anyway. And sure, you may fall, but you also may fly. And it’s absolutely worth the risk.